The Order API has the ability interact with retailers systems at several key points in the order process. For example you can use the API to retrieve customer orders, the order number, and details of the order (containing customer information and the items requested). Retailer Order state changes are made through submitting an XML object to the Retailer Order resource. 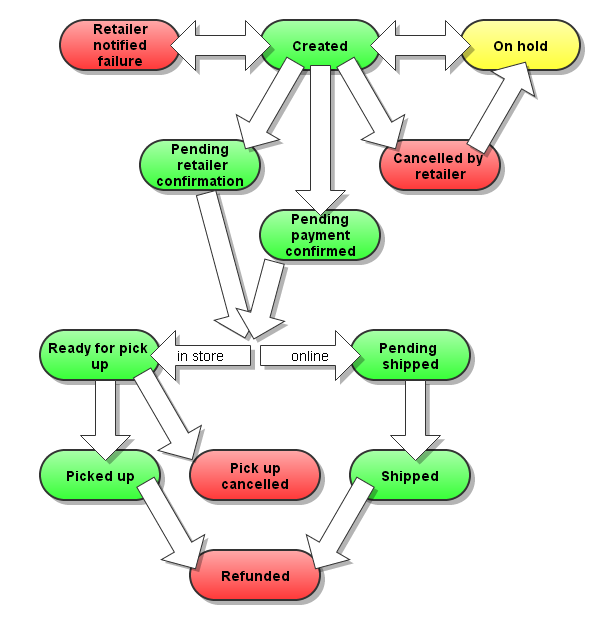 Depending on whether the order is pick-up-in-store or ship-from-warehouse, there is a specific lifecycle as shown in the order lifecycle diagram below. The full list of order statuses are here, in the order of where they are possible in the order lifecycle. The following represents the possible statuses that an order can move into from an initial starting status. In the sections below, some status changes may require the retailer to be notified. Note that the notification is via a POST of the Retailer Order to the retailer’s order endpoint. The system will assume that the notification was successful if it received a HTTP 200 response code, regardless of content also returned in the body of the HTTP response. The APIs for the shipped and refunded status change as well as the ready for pick up and picked up status changes are detailed below. Trigger: retailer action (but see note). Once order has been accepted and processed by the retailer, a confirmation is sent back containing the retailer’s order reference ID. This signals that the order has been received by the retailer successfully, and to wait for shipping confirmation. NOTE: depending on the retailer integration (and therefore the order delivery method) this step may not be necessary, e.g. if the retailer is able to produce an order ID synchronously in the response of the original order notification sent by Omnivore to the retailer’s system. Trigger: retailer action. Once payment is successful the retailer will ship the order, providing the tracking/shipping reference at the same time. products - optional element. If included, product (and therefore retailer_ref, sku and quantity) is mandatory within the element. The products element allows the user to specify which products in the order have changed status. In the above example, only 1 of the products under SKU agf1037724 in this order has changed state. NOTE: <quantity> shows the number of items for that SKU that have changed state in this call, NOT total quantity changed so far. So, if the order contains 3 items for SKU agf1037724 and 2 had already changed state in a previous call, the above would change the 3rd item’s state and trigger the entire order to change state to ‘shipped’. If <products> is omitted, it is assumed that the entire order is being changed, e.g. all products in the order have been shipped in a single delivery. Trigger: retailer action. Once order has been allocated to a store, a notification is sent back containing the retailer’s (optional) pick up instructions and (optional) store pick-up code; this code will be used by the customer at pick up to verify that they are the intended recipient of the goods. The products element allows the user to specify which products in the order have changed status. In the above example, only 1 of the products under SKU agf1037724 in this order has changed state. NOTE: <quantity> shows the number of items for that SKU that have changed state in this call, NOT total quantity changed so far. So, if the order contains 3 items for SKU agf1037724 and 2 had already changed state in a previous call, the above would change the 3rd item’s state and trigger the entire order to change state to ‘ready-for-pick-up’. If <products> is omitted, it is assumed that the entire order is being changed, e.g. all products in the order are now ready for pick up at once. Trigger: retailer action. The customer has collected in-store. The product elements allow the user to specify which products in the order have changed status. In the above example, only 1 of the products under SKU agf1037724 in this order has changed state. NOTE: <quantity> shows the number of items for that SKU that have changed state in this call, NOT total quantity changed so far. So, if the order contains 3 items for SKU agf1037724 and 2 had already changed state in a previous call, the above would change the 3rd item’s state and trigger the entire order to change state to ‘picked-up’. If <products> is omitted, it is assumed that the entire order is being changed, e.g. all products in the order have been picked up in a single delivery. Trigger: retailer action. The order has been marked as ready for pick up but now needs to be cancelled, e.g. due to a customer no-show. This is an end state and all products in the order are marked as cancelled. Retailer Order is set to status ‘pick up cancelled’. Trigger: the retailer has requested an online (as opposed to in-store) refund after processing a return. The shopper is notified via email by the system. This is an end state. The retailer may elect to refund the full price of all items in the order with or without the shipping amount back to the customer’s credit card via this API. The refund of the commission back to the retailer is triggered. Allow bulk update of orders to the Shipped state. Orders are specified one per row. There is no heading row. Retailer Order is set to status ‘shipped’. Allow bulk update of orders to the Ready For Pick Up state. Orders are specified one per row. There is no heading row. Retailer Order is set to status ‘ready for pick up’. Allow bulk update of orders to the Picked Up state. Orders are specified one per row. There is no heading row. Download the latest product feed for the specified retailer and marketplace. Upload an order XML payload to create orders in Omnivore for the specified retailer and marketplace.